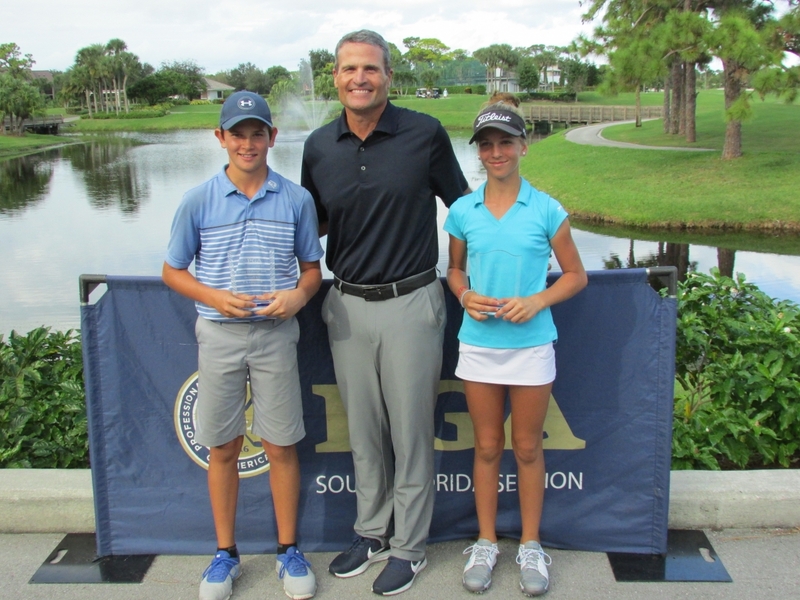 ATLANTIS, Fla. – This week, the South Florida PGA Junior Challenge Tour presented by The Honda Classic held Challenge Tour Event #12 on the Gold Course at Mariner Sands Country Club in Stuart, FL. Two talented siblings captured victory after two breezy days. The boys’ division featured an exceptional leader board after round 1 with countless juniors packed at the top. Round 2 proved to be far different from that. After firing a 79 in round one, Duncan Fischer shot his personal best 71 in round 2 leaving him in a tie atop the leader board with Maxmilian Jelinek. Both finished the event tied at 150 sending them into a sudden death playoff. After 2 exciting playoff holes, Fischer walked away as the Boys 13-18 overall champion, Maxmilian went home with the Boys 13-15 division title. The winner of the Boys 16-18 division was Marcus Calabria posting a 74-77 for a two-round total of 151. In the Girls division, Jordan Fischer, sister of Duncan Fischer started the weekend out strong posting a first round score of 73. Fischer followed up her 73 with an outstanding 75, running away with the overall trophy by eight shots. Just behind Fischer there was a close race to win the divisional award. In the Girls 16-18 division, Brianna Fitzpatrick (78-81) came out on top with a two-day total of 159, and in the Girls 13-15 division at 156, Hanna Charlotte Koelker took home first place with a pair of 78’s. Competing in her first Challenge Tour event, Kayla Bryant of Boca Raton, FL took home the Girls 11-12 division after firing two rounds of 79. For the Boys 11-12 division, Jayden Brar took home first place shooting ever par both days.